Comarch looks forward to Decavi Non-Life Insurance Trophies! 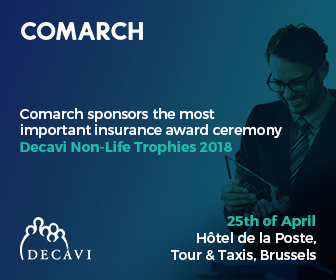 April 25 is the day when insurance industry professionals gather in Brussels to participate in Decavi Non-Life Insurance Trophies. Comarch is proud to sponsor of the event. Decavi Insurance Trophies initiated in October 2000. It is the annual prize-giving gala, which brings together leading insurance companies. These trophies are awarded twice a year, once for life insurance and the other for non-life. The main aim of the event is to reward innovative companies for their contribution to the development of insurance products and services. Companies are evaluated by the panel of judges. Winners are chosen based on criteria including technical characteristics and innovative aspects. Comarch delegates – Raphaël de Schrynmakers and Wim Van Wilderode will join the event. Decavi is more than prize-giving gala. We are proud to inform that this year’s Decavi letter is available for download in both French and Dutch. The letter covers studies on the digitalization of the insurance sector, including topics focused on omnichannel approach, gamification, AI, IoT, blockchain and digital transformation.